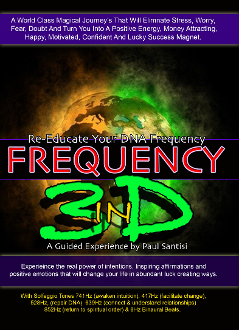 For (1) Brand New copy of Paul Santisi's guided mediation "Frequency in 3D Sound"
What is 3D Sound? 3D sound is experienced with headphones on. 3D sound uses a very expensive microphone to capture sound that is 100% organic and lifelike. You will feel as if you are surrounded in the space around you. Paul Santisi has pioneered the 3D mediation market and has reach international status with how amazing and effective his 3D meditations are. YOU WILL BE BLOWN AWAY! NEW AND SPECTACULAR Guided Meditation. Mind blowing 3d Sound - Unlimited positive suggestion - Deep Relaxation with Solfeggio Tones 741hz(awaken intuition) 417hz (facilitate change) 528hz(repair DNA) 639hz(connect & understand relationships) 852hz(return to spiritual order), and 8hz Binaural Beats. Hundreds of positive subliminal affirmations the change your body's frequency and positive energetic vibrations. Expand your positive energetic vibrations and feel the change! Full money back - because we know its that good! Contains Binaural Beats, Solfeggio Tones, a pleasing voice and fantastic music with healing frequency's and calming beats all in Mind Blowing 3D Sound!